A distant boundary – For the fainthearted . . .
What was wrong with radios where you had one knob that you turned to turn them on and to increase the volume, and another knob to find the station? The car radio seems has an array of buttons with incomprehensible abbreviations, not to mention additional controls in the steering wheel, and seems to have the possibility of thirty-six preset stations. How many people can name thirty-six radio stations, let alone listen to them? Technical incomprehension means that there are four stations tuned in – Lyric, RTE 1 and Radio 4 and Radio 5 from the BBC in England. Driving at 11 o’clock last night, a sweep through the four brought me to Radio 4. It was a cool March evening and there was test match cricket commentary. It took a moment to work out where it could be, seasons and time zones cause confusion. There must have been a drinks break or some break in play, because one of the commentators was in poetic mood, describing the idyllic scene in New Zealand. It felt more like Worcester on a gentle summer’s day, he thought, than a major test match between two countries. 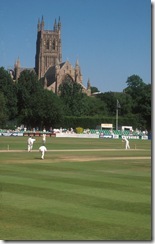 The mention of Worcester launched the other commentator into a reverie. 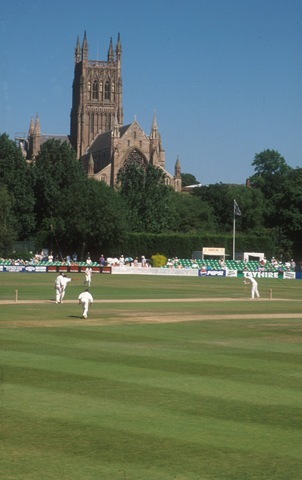 Memories of the place they regarded as the most beautiful cricket ground in the world, sitting between the cathedral and the Severn were exchanged, along with memories of cricketers who had graced the wicket there back in the 1960s. For a moment, it was not Dublin on a damp March night. You could feel the breeze off the river and hear the chatter of voices and the clink of glasses at the bar, punctuated by the sound of willow on leather as the ball was driven into the covers. For a moment, the world seemed a happy place and nothing could mar the view from the boundary. While the England bowlers were being pounded by the New Zealand middle order batsmen, their government back in London was voting to refuse to allow the people of England the right to vote on the future of their country. Ah, cricket, lovely cricket. You are lucky to be getting Radio 4 etc I heard last week that RTE1 is to stop transmitting on MW this month!!!! Damn car only has MW and Fm no LW. Worcester conjures up memories of 6 of us on a 60′ barge getting in onto the Birmingham and Worcester Canal from the River Severn. What a cracking holiday.